In this work which premiered only a week prior in New York City, Rebecca Margolick (a Vancouverite now based in NYC) has choreographed a visceral duet for herself and Chuck Wilt while also creating a dialogue between the dancers and two onstage musicians. Ruby Namdar, whose role is listed as “special guest” in the program, opened the show with a short lecture about sin and surveillance in our contemporary society. According to him, surveillance can be either scary or comforting, depending on how we choose to look at it. The question, he said, is whether surveillance is needed for morality. While it felt a bit preachy at times, this lecture provided food for thought and set the theme for the performance to come. Margolick and Wilt began slowly, centre stage, as a narrow beam of light divided them. Close up video projection of their naked bodies echoed what they were doing on stage, but in a larger-than-life, slow motion manner that allowed us to dwell on its meaning. Perhaps they were representing Adam and Eve, which Namdar talked about. The two dancers reacted to each other’s movements, moving in a slow, controlled fashion and building up to a faster pace as the music did the same. The live music added to the intensity of their performance, fuelling their determined motion. The two often seemed to approach intimacy, only to pull back and fall into old habits of isolation. The choreography flowed through Margolick and Wilt so smoothly, and when Margolick really let loose, after shaking her head back and forth many times in a state of frustration, she was a powerful force propelled by the drum beat and suspended by the atmospheric reverb. 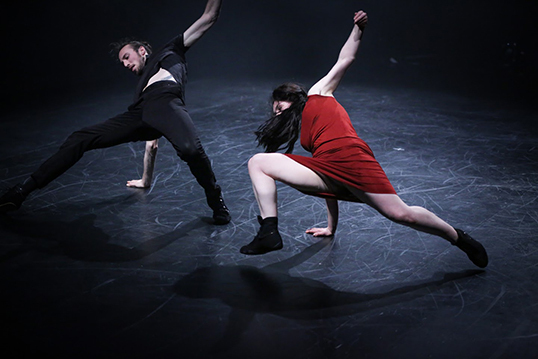 The piece built up to a frantic energy with both dancers running around the stage, pushing and pulling each other. The music seemed to be a strong driving force behind the creation. Near the end, Margolick knelt down in front of a camera that projected her face on the back wall as she said things like “I’ve been watching you.” This section seemed a bit out of place, and the meaning behind it was unclear, other than referencing the surveillance touched on at the beginning. More projections of their naked backs and necks finished off the piece as their on screen movements translated to what they were doing on stage. They seemed to settle into common ground, coming to a natural conciliation as the piece drew to a close. Margolick’s powerful choreography combined with the musical composition of Maxx Berkowitz and Jake Klar, made for a thought-provoking, satisfying evening of performance.